While compiling my Golden Pints for last year, Best UK Brewery was a category that had me thinking long and hard. I eventually plumped for Brodie's because I'd drunk plenty of their beer in 2013 and couldn't remember a bad pint. In fact, I could remember lots of good ones and a few great ones. The thing is, it can be pretty hard to find their beer unless you venture to one of their two London pubs or to those of their longer established customers (such as Brighton's Evening Star) because with Brodie's, supply has always out-stripped demand. If you've ever visited the King William IV in Leyton and ventured out the back to the brewery, you'd probably think it's no coincidence that co-founder James Brodie is a huge fan of Doctor Who as he basically plies his trade in the brewery equivalent of a Tardis. The small outbuilding offers no clue as to what lurks within and every bit of space is used to the fullest. Lack of space certainly hasn't held them back though and they've managed to turn out plenty of fantastic beer, if nowhere near enough to satisfy the high demand. Recent news that they plan to expand into a larger space came as no surprise and it seems 2014, their 6th year of operating, may be the year Brodie's comes of age. 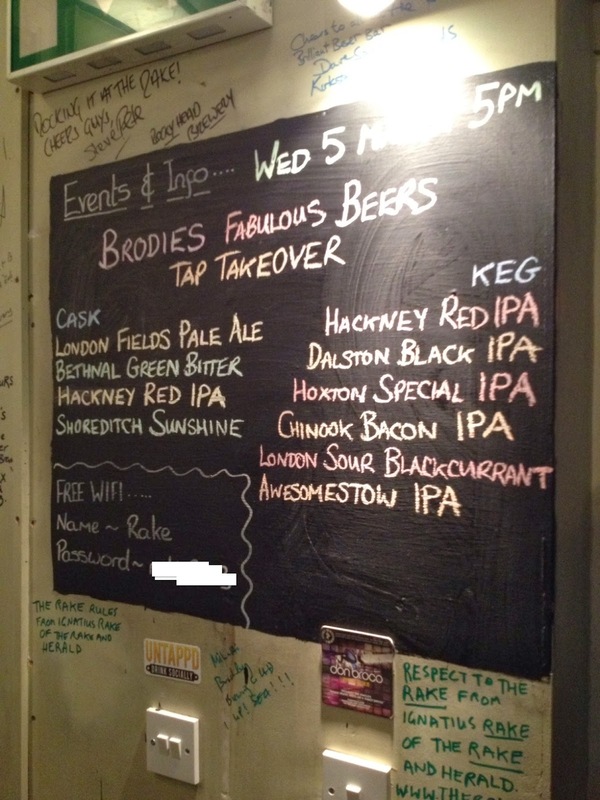 Around six months ago, Jonny Bright (formerly of BrewDog) joined the brewing team and I had a chance to catch up with him for a chat at a tap takeover at The Rake. Jonny explained that they wanted to put an event on to mark something of a milestone as they've spent the last few months polishing and refining their recipes, ironing out some issues with their over-worked brew kit and laying the foundations for this year's planned expansion. In a way, a bit of a pause for breath to take stock and enjoy the progress they've made before ploughing head on into what promises to be a very busy year for them. Jonny went on to explain that they've been pretty pleased with the refinements they've made to the beers themselves and are starting to think ahead to plan their migration to brewing them on a much larger scale in the new brew house. 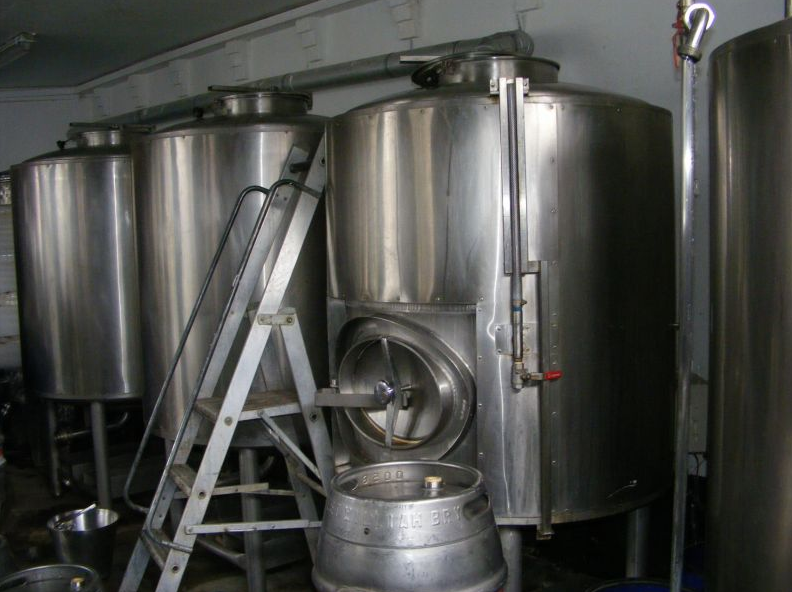 Brodie's has always been known for being prolific, both in terms of volume (especially considering they operate on such small kit - which in the past has meant some epically long brew days) and overall variety. Brewing on smaller kit allows for much more flexibility of course with less risk if a brew or two doesn't quite turn out as planned. They've taken plenty of risks in the past (Sake IPA anyone?) with some spectacular successes as a result, which really helped put them on the map. Brewing at a 20BBL length is an altogether different proposition however and it seems the Brodie's team are ready to face that migration head-on. Jonny is especially proud of the quality of the cask ale they're putting out of late and the condition of the beers on the bar that night was testament to that. Brodie's has always casked their ales with keg coming a bit later. They've not been able to bottle much recently but hope to step that up again once they have more space available. Their appetite for the wild and wacky has certainly not subsided and the Chinook Bacon IPA on the bar (keg) underlined the continued desire to experiment with different flavour combinations. I enjoyed a half of that as we chatted and it was really good - the aroma definitely offering a clue as to the source of the name! That particular brew marked the first day's work of Angelo Scarnera (formerly of Brew Wharf), the latest addition to the Brodie's brewing team. Angelo brings great pedigree and experience to the fold and already knows his way around the existing brew kit, so I'm sure he'll feel right at home. So, what of the rest of the beers on offer? In addition to the Chinook Bacon IPA, I sampled the Dalston Black IPA, Awesomestow IPA, Hoxton Special IPA and London Sour Blackcurrant - the latter being the only one I'd not sampled before. All were bang on form with the Dalston Black and Blackcurrant Sour being my picks of the evening. If you're lucky enough to spot them on your travels given the short supply, get stuck in. I'm sure on sampling you'll be pleased that 2014 should be the year there will hopefully be much more of their fabulous beers to go round.